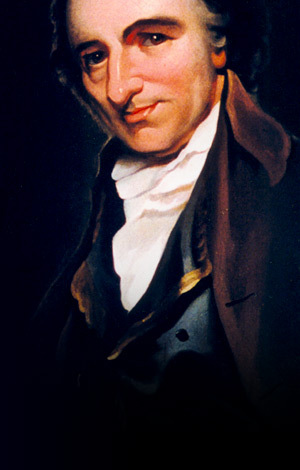 Thomas Paine (1737 – 1809) was the most forward-looking thinker of the American Revolution and the foremost advocate of the democratic spirit of individual liberty, religious equality and social justice. He embodied the most admirable qualities of Franklin, Washington and Jefferson with few of their foibles. He was daringly visionary, truly brilliant, supremely articulate in speech and in writing, indomitable in his service to the Cause of Independence and free of the major vices of his time: slavery, monetary greed and political ambition. His universal humanitarianism was all-embracing and his radical proposals proved to be fundamental correctives to the social, political and economic ills of his era. He was (and is) the gold standard of the true revolutionary: principled, clear thinking, courageous, magnanimous to his enemies and refreshingly inclusive in both thought and conduct. The significant contributions of Paine to American Independence, the French Revolution and to future generations were potent and far-reaching. Paine’s Common Sense was the catalyst that catapulted the colonies into the quest for political independence. His Crisis Papers inspired Washington’s troops when their morale was sorely tested and his Rights of Man gave confidence to the common man in his own innate dignity, his natural entitlements and his civic responsibilities. Furthermore, Paine’s fertile mind – ever the servant of his compassionate heart – led him to write one of the first American essays against slavery, to set forth one of the first arguments for public welfare and a guaranteed annual income and to prophetically call for a “Congress of Nations” to settle international disputes. As a member of the French National Assembly, he helped to draft the “Constitution of the Republic of France” and undoubtedly influenced the drafting of “The Declaration of the Rights of Man and of the Citizen”. In the past seventy years, Paine has been increasingly accepted as a major creative force in the American Revolution and as a lucid political thinker. He has been quoted in the political realm by presidents as diverse as Franklin Roosevelt and Ronald Reagan. He has been celebrated by feminists, humanists, religious thinkers, scientists and artists. His resurgence in both academic and political circles is timely since America is once again at a historical cross-road, a stirring and confusing period which “tries men’s souls”. Turning to Paine’s telling prose and fearless example, many of today’s generation find Paine’s enthusiasm and optimism uplifting and his inclusive vision compatible with the emerging global culture of national interdependence and human solidarity. There is undoubtedly an increasing willingness among many to include Paine in the pantheon of those heroes who fought for a ‘universal republic’ for all mankind. This is fitting recognition for one who called himself a ‘Theophilanthropist’, a lover of God and man. Beyond all his marvelous achievements, however, there is a deeper truth about Paine. He was not simply a benevolent revolutionary, an incisive political thinker, a gifted pamphleteer, a serious student of science, a committed deist or a brilliant visionary. He was certainly all this. But, more than that, he was a forerunner of the world citizen of the future. He was a paradigm of the ‘man of tomorrow’ because he wove together in his very standpoint and actions the golden threads of impersonal spirituality, universal responsibility and intellectual originality. Paine was always more than an American and more than an 18th Century enlightenment figure. He was, like Lincoln, meant “for the Ages”. The resurgent interest in Paine is because the thinking of the world has finally moved in his direction. Modern consciousness is becoming more global and increasingly concerned with the needs and rights of all members of the human family. The ubiquity of human suffering has forced us out of our sectarian and ideological shells and made us appreciate the importance of human interdependence and international cooperation. Perhaps we see less through a ‘glass darkly’ than at any other time in the last two thousand years. We now realize that Civitas Humana or the ‘City of Man’ is the true focus of the pioneers of the future. This is precisely why we can turn to Paine for instruction and inspiration. He was always forward looking and able to make eternal principles contemporary. It is no wonder that the most oft quoted phrase of Paine’s is: “My country is the world and my religion is to do good.” He was a ‘prophet of the future’ as well as a luminous figure of the American and French Revolutions. To honor him is to salute the best in ourselves and all men and women who dedicate their lives and their fortunes to the civilizations of tomorrow.